Kent, the “Garden of England”, was also the market garden for its giant neighbour, London. The regular round of seasonal work training and picking hops, gathering fruit from the orchards and picking peas, beans and other arable crops attracted families of Gypsies who returned to the same encampments and worked on the same farms from one generation to the next. 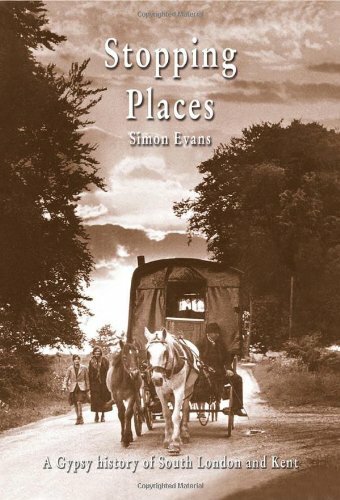 Stopping Places tells the story in words and pictures of the traditional life of the Gypsies when they lived in “bender” tents and wooden horse drawn wagons until the post war winds of change swept away these ancient ways as mechanisation reduced the need for casual labour leading to the Gypsies being forcibly evicted from their traditional encampments and forced to live “on the verge”. The stunning period photographs and the vivid words of the Gypsies themselves recall a lost world and the often violent transition from a semi nomadic life style to the concrete ghettos of officially designated council sites ushered in by the Caravan Sites Act (1968). It also evokes some of the isolation and loss of identity which followed a reluctant move “into the brick” and the replacement of the open sky by brick walls and tiled roofs. Kent, the 'Garden of England', was also the market garden for its giant neighbour, London.